The song is “To Bob Ross, with Love,” by Gym Class Heroes, and they crush it on more levels than I have blog space to discuss. So I’ll give you the bullet points. I didn’t have coloring books growing up. I had blank sketch pads. My parents didn’t want to impose on me the pressure of conformity and a color-by-numbers world. When I wanted to create, I was given a blank sheet. It’s served me well. 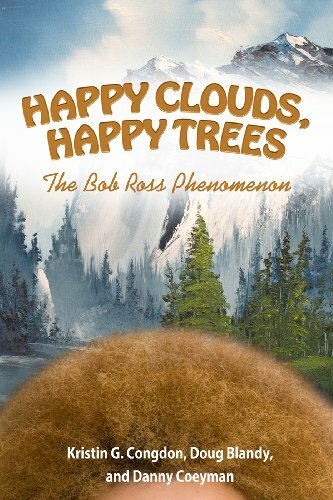 So I admit there was trepidation when I started reading Happy Clouds, Happy Trees: The Bob Ross Phenomenon. It’s an academic book, from the University Press of Mississippi, penned by Kristin G. Congdon and Doug Blandy, and illustrated by Danny Coeyman. I feared that an academic treatment would reduce those joyful half-hours of public television bliss to a post-structuralist treatise. Thankfully, that is not the case. The focus of Happy Clouds, Happy Trees is the phenomenon of the painter and the cult-like nature of his fans, which is incredibly fascinating. Ross is all the more mysterious for the minimal amount of unauthorized or paratextual materials surrounding him. Mostly, what we know of Bob Ross comes from his program. We don’t have a cache of letters, no scandalous videotapes and, most significantly, no family interests looking to exploit the painter, who died in 1995, for a fast buck. That’s good and bad. The good is that those of us who grew up watching Ross still know him only by his on-screen persona, not his off-camera flaws. By comparison, the premieres of The Joy of Painting and Michael Jackson’s Thriller came a mere 42 days apart. It’s still possible to watch The Joy of Painting without feeling dirty. The mystique of the painter’s life has fueled his cultish (in the best sense of that word) following, and the authors do a wonderful job of exploring the Bob Ross phenomenon and its devotees. One of the most fascinating narratives in the book is the trinity of Ross, Andy Warhol and Thomas Kinkade. While Ross and Kinkade are sometimes paired in the collective consciousness (due to their being the only two contemporary painters many Americans know by name), they could not be more different. While Ross did his show for free (his income came from art instruction and supplies), Kinkade never met a check he didn’t cash. Ross idealized the wild outdoors, while Kinkade idealized property and domestication. Ross never sold his artwork, while Kinkade established a corporation, chain stores and a subdivision modeled after his paintings. Perhaps the most significant difference is that Kinkade automated the process, mass producing prints with a few dabs of paint (done by other artists and, occasionally, Kinkade himself). Ross was all about the process. It wasn’t The Profits of Painting, it was The Joy of Painting. We don’t collect Ross, we connect with Ross. The focus is the act of creation, not its end product. The authors argue, rather convincingly, that we should instead be comparing Ross with Warhol. The two make an odd couple at first, but by book’s end, the connection is apparent. Both defied the norms of fine art and gallery culture (though they were received very differently by that world), and both had a working-class ethic to their craft. I doubt that MoMA will be racing to organize a Ross retrospective anytime soon, despite the well-composed arguments of Happy Clouds, Happy Trees. Ultimately, as the authors write, it doesn’t matter. The Bob Ross Phenomenon has nothing to do with fickle gallery predilections or snooty art criticism. It’s all about the man, our connection to him and that ineffable thrill of creation. Bob had a word for it.